The Diamantina Institute at the University of Queensland has a useful glossary of research terms online. How dangerous is that cult? …members of the Religious Reich and their fellow theocrats will find that their own organizations (and quite a few large mainstream churches) are far more “cult-like” than many of the minority belief systems they so bitterly oppose. The Waymarking site lets you pinpoint where you’ve been and what you found there. There’s even a category for Town Clocks, such as this one in the small town of Stayner. You can use it to find the nearest geocaches or even the nearest hotels. 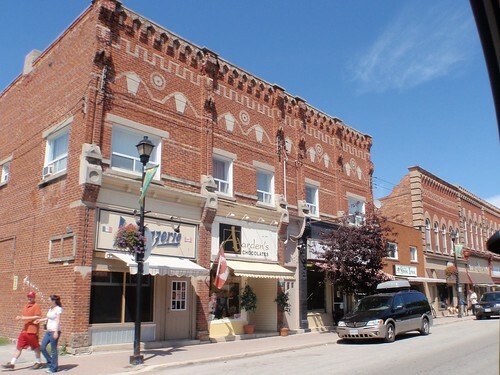 The reason I’m focusing on Stayner is because the town clock is near some 19th-Century buildings that I photographed there. In other words, these are papers that deal with mathematics and with quantifying results. It’s one of the ways in which the Web makes science much more accessible to us. Hat tip to Blake Stacey at Science After Sunclipse. About.com has a lot of nice articles about rocks and rock formation by Andrew Alden. Already this morning, I’ve learned how to tell siltstone from shale or sandstone or mudstone, what a thunder egg is, that agate and chert are both types of chalcedony, that alabaster is a kind of travertine, and how banded iron formations were formed. They date back to when the earth’s atmosphere mostly free of oxygen, and any oxygen produced by photosynthetic bacteria quickly bonded with iron in the earth’s crust. In the discussion over at Pharyngula about CNN closing its science news department, someone mentioned two good resources for science news: Eureka Alert! and Technology Review.